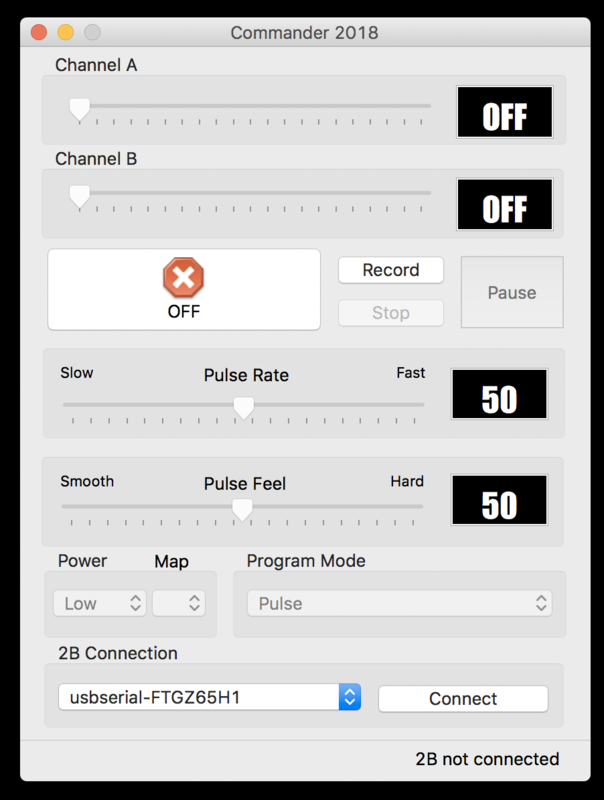 Commander is a free computer based control program that allows you external control of your E-Stim Systems 2B from a connected laptop or PC. It runs on Windows 10, MacOS and we also offer an unsupported Linux version for the real geeks amongst us. You can download Commander 3 from our downloads page. The software is free, and is available for Windows 10, MacOS and Linux. The original version of Commander (Commander 2) also provided limited ability to control your 2B over the internet, but that functionality has now been expanded and improved and passed to E-Stim Connect. For more details about E-Stim Connect visit https://e-stim.online. Commander 3 now allows you to 'record' your play sessions, and play them back later - and as these are simple text files, you can even share them with your partner, friends or even the world - the choice is yours. In order to run Commander 3, you will need an E-Stim Systems 2B, and a Digital link Interface. You will also need a computer running Windows, MacOS X or Linux with a spare USB port. You can download the software from our Downloads page. How do I select Commander? E-Stim.info is an open information portal run by E-Stim Systems Ltd. All rights reserved.